Part Used : Castor Leaves, Castor Seeds, Castor Roots, Castor Oil. Habitat : Common in distributed areas and waste land. 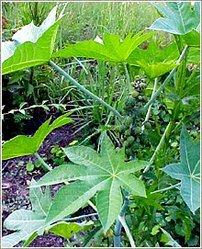 Uses : Castor leaves are used externally by nursing mothers to increase the flow of milk. Castor Oil is a natural emollient and can be applied to the skin and hair as a softener. Juice from the leaves of the Castor plant is used against rheumatism, headache, dropsy (edema), abscesses, ringworms, and warts. Castor Oil is used for temporary constipation, but is not effective for chronic constipation. It has also been used for colic and acute diarrhea due to slow digestion. Castor Oil can support labor and delivery. Externally Castor Oil is used to treat ringworm and itch. Castor oil is commonly used for the preparation of hair-oils, hair fixers and aromatic perfumes. It is used as an ingredient in hair lotions and tonics in concentrations of 0.5-20 per cent. Leaves applied to the head to relieve headache and as a poultice for boils. Oil used externally for dermatitis and eye ailments.